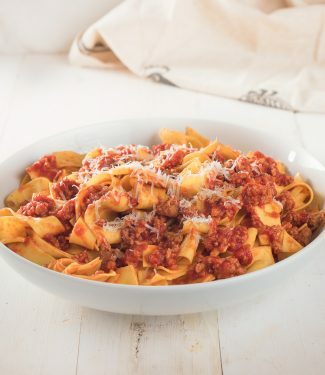 Neapolitan ragu is a great alternative to the heavier and more complicated ragu bolognese. It’s all about tomatoes and pork. A bit of veal and some white wine. Maybe an onion. Simple. No garlic, no basil, no oregano. No secret ingredients. Just tomato and meat flavour. Clean. Pure. Delicious. Try it. You’ll be surprised how good easy tastes. 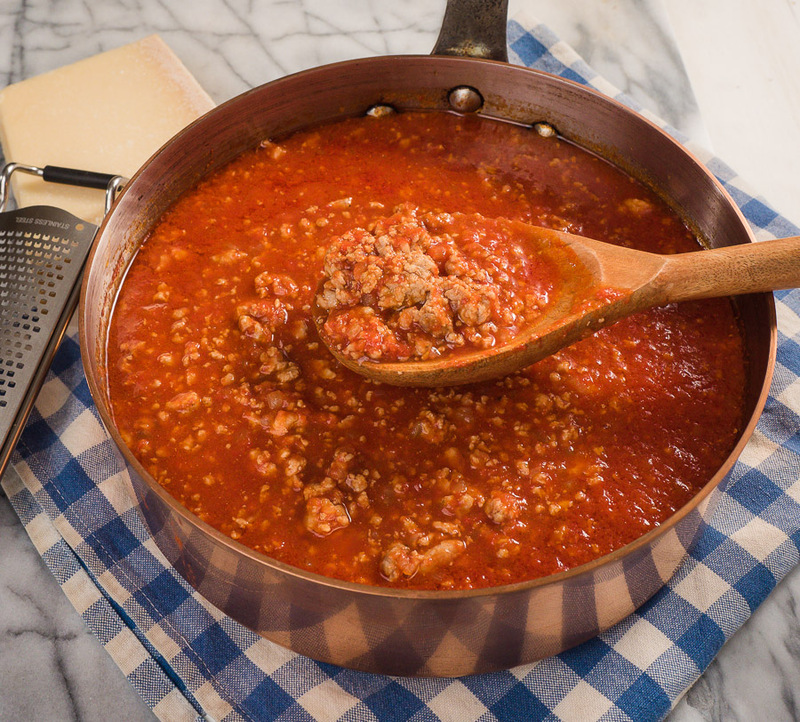 It goes pretty much like any other ragu. Brown the meat with some onion, add some wine. Reduce. Add tomatoes and simmer. For hours. This is slow food. You can’t make it fast food. Make sure you have time when you start this. Or make it the day before. It reheats fine. This isn’t in your face rage. Neapolitan ragu flavours are lighter. There’s plenty of flavour. The sausage sees to that. But it isn’t heavy. No beef. No beefy taste. There’s nowhere to hide in this recipe. The simplicity means every ingredient has to pull its weight. So buy good quality pork. The best Italian sausage you can get. Go see your butcher. They will fix you up. This isn’t a place to use up those Johnsonville brats you have in the back of the freezer. Make sure you use good quality canned tomatoes. Tomatoes are the star ingredient. Don’t skimp. San Marzano tomatoes are a good choice if you can get them. Prepping your tomatoes is a nice touch. Buy whole tomatoes and pass them through a food mill. If you don’t have a food mill you can substitute passata. Won’t be quite the same though. If you are going to use passata definitely try to get the best you can. Lousy passata makes lousy sauce. Did I mention there is nowhere to hide? No heavy handed seasoning here. Good quality pasta counts as well. Neapolitan ragu is a labour of love. Might be an idea to try some of those expensive pastas you see in Italian delis. A nice broad noodle like tagliatelle or pappardelle works well. 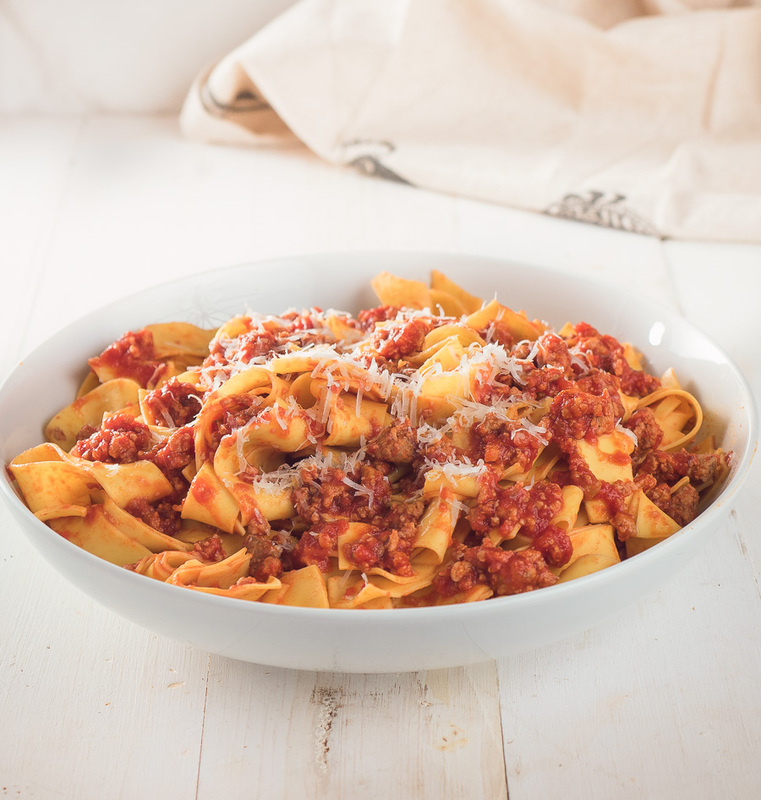 Toss Neapolitan ragu with pasta and sprinkle some freshly grated parmeggiano reggiano on top. Maybe a bit of fresh torn basil and a bit of black pepper. Just pure comfort food. If you have some left over try making Neapolitan lasagna. That’s some crazy good stuff too. This sauce is about tomatoes and sausage meat. Make sure you get the best you can. Add the white wine and boil until almost dry, about 5 minutes. Pass the tomatoes along with their juices through a food mill to remove seeds and membranes. Add the pureed tomatoes and the salt. Cover loosely and simmer 2 to 2 1/2 hours. Pass the tomatoes through a food mill if you have one. If using passata substitute 2 25 oz bottles for the two cans of tomatoes. Life-changing Experiences come when you least expect them. This sauce was one of them. This was the best sauce I’ve ever made (according to my Italian boyfriend who called it “a sauce like my Nona’s”) I want to smear it on my toast this morning and put it in my cereal. So simple and SO tasty. More please. thanks for sharing ! I am so happy to be part of this. Thank you! Absolutely. Just make sure you brown the meat in two batches. After that just double everything and go. If you have leftovers (I think you will:-) try the Neapolitan lasagna. Good Idea! Ok thank you so much for the advice. Will be so yummy and i’ll try the lasagna! Best sauce I’ve ever tasted!!!! You are very welcome. Hope the boys like the lasagna!